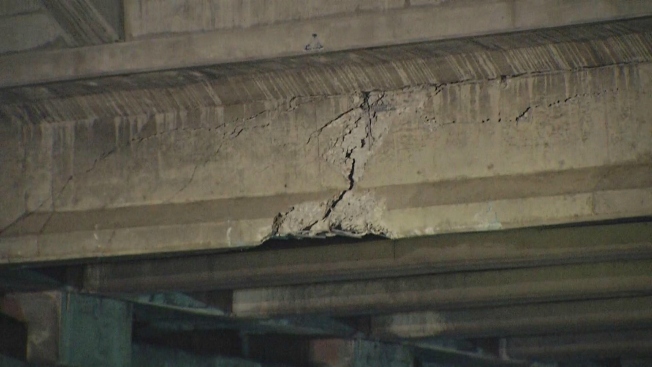 A Caltrans crew on Friday investigated the structural integrity of an overpass in Palo Alto after a dump truck smashed into the structure. Bob Redell reports. 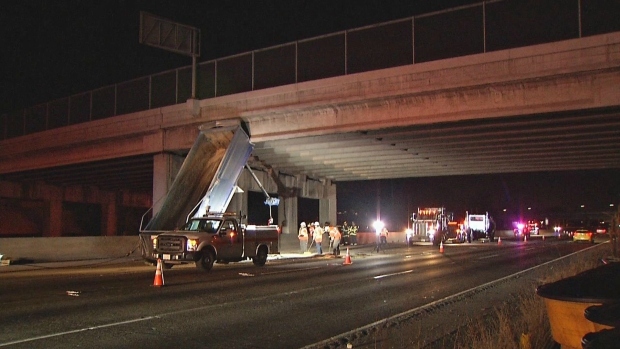 A dump truck slammed into an overpass on southbound Highway 101 in Palo Alto late Thursday night, damaging the structure and creating a traffic backup on the freeway, according to the California Highway Patrol. The 2017 Peterbilt dump truck hit the overpass at the Embarcadero Road exit, creating a 27-foot-long crack in the structure, according to the CHP. All lanes reopened before 6 p.m. Friday. The impact of the crash was so severe that the dump truck's roughly 20-foot-long bed was completely severed from the 30-foot-long truck, according to the CHP. CHP officials determined that the driver, who was later identified as 24-year-old Sukhpal Singh of Fremont, forgot to lower the dump bed after leaving a nearby construction site. A Caltrans engineer from Sacramento was called in to assist local engineers with assessing the damage and formulating a solution. Singh was transported to a nearby hospital after hitting his face on the steering wheel during the crash, according to the CHP. Alcohol or drugs did not play a role in the crash.